Following the death of Richard, Duke of York it was left to his son - Edward, Earl of March - to continue the fight for the English throne. However, first he needed to ensure the security of his Herefordshire estates from Lancastrian forces. 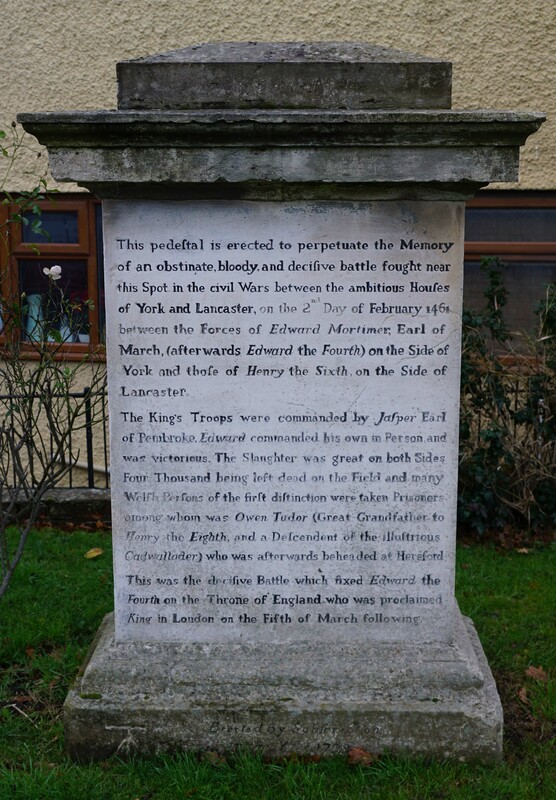 Edward achieved this at the Battle of Mortimer's Cross (1461) where he decisively defeated a hostile army under Jasper Tudor, Earl of Pembroke. By the late 1390s the regime of Richard II was seen as tyrannical and unsuccessful prompting his overthrow by Henry Bolingbroke. With widespread support amongst the English ruling class, he took the throne as Henry IV (1399-1413) usurping of the normal line of succession. Both he and his son, Henry V (1413-22), were effective Kings but they were followed by Henry VI (1422-61). By the 1450s his ineffectiveness caused by periodic mental illness, coupled with the dramatic defeats of the English in the Hundred Years War, provided the backdrop for the ambitious Richard, Duke of York to make a bid for the Crown. Richard claimed descent from Lionel of Antwerp, Edward III's second son, whereas the three Henrys were from the line of John of Gaunt, Duke of Lancaster who had been the third eldest. Richard, prompted by rivalry at Court, pressed his claim with initial skirmishes dovetailing into the first Battle of St Albans (1455). Although a truce quickly followed, the bitterness with which that battle was fought - resulting in the deaths of several prominent Lancastrian supporters including Edmund Beaufort, Duke of Somerset and Henry Percy, Earl of Northumberland - set the tone of the subsequent dynastic struggle (which became known to history as the Wars of the Roses). In 1459 the fragile peace between the Lancaster (Henry VI) and York (Richard, Duke of York) factions broke. Richard Neville, Earl of Warwick and a prominent Yorkist supporter, defeated the Lancastrians at the Battle of Northampton (1460) and captured Henry VI. The Yorkists, after having failed to secure backing for an immediate coronation of Richard, settled for the Act of Accord - an agreement instigating Richard as Lord Protector and heir to the King whilst disinheriting Prince Edward, Henry VI's natural son. Unsurprisingly Henry's Queen - Margaret of Anjou - opposed this move and raised an army in Yorkshire to reverse the coup. Richard moved to prevent this but was defeated and killed at the Battle of Wakefield (1460). The Lancastrian faction hoped that the Duke's death would end the conflict but his son - Edward, Earl of March - took up his father's claim. He was already an experienced soldier and, at the time of his father's death, was operating from his estates in Herefordshire. Edward was in a difficult position. In England the Lancastrians had mustered a large army but he was unable to leave Herefordshire due to the presence of Jasper Tudor, Earl of Pembroke in South West Wales. The Tudors were staunch Lancastrians as Owen Tudor had married Henry V's widow, Catherine of Valois. Following the Royalist defeat at the First Battle of St Albans (1455), Jasper had ensured the security of Milford Haven for the Lancastrian cause which gave them a secure location ideal for importing troops from Scotland, Ireland or the continent. 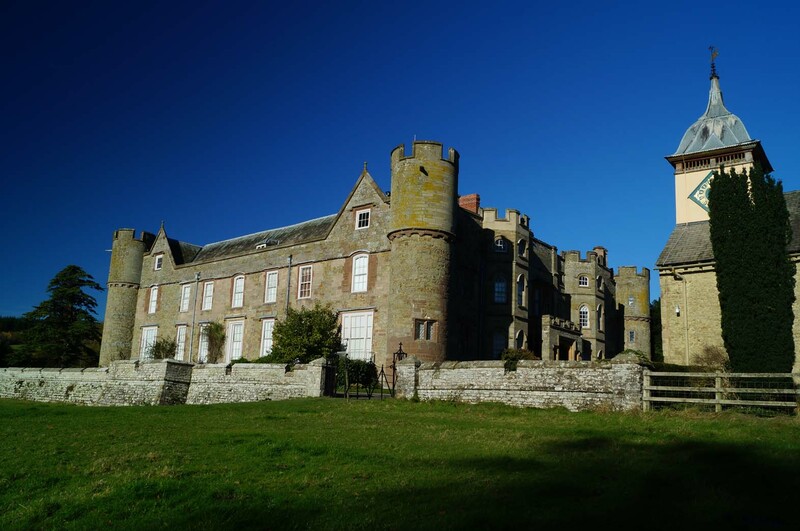 In late January 1461 Jasper Tudor marched out of South West Wales planning to start operations against Yorkist estates in Herefordshire with the specific intent of breaking the power of the Earl of March. Advancing via Brecon, he moved towards Edward's stronghold at Wigmore. However, Edward was aware of his movements due to receiving intelligence via the Dwnn family at Kidwelly Castle. Edward probably established his forward base at Croft Castle to see whether Jasper would veer towards Wigmore or Ludlow. 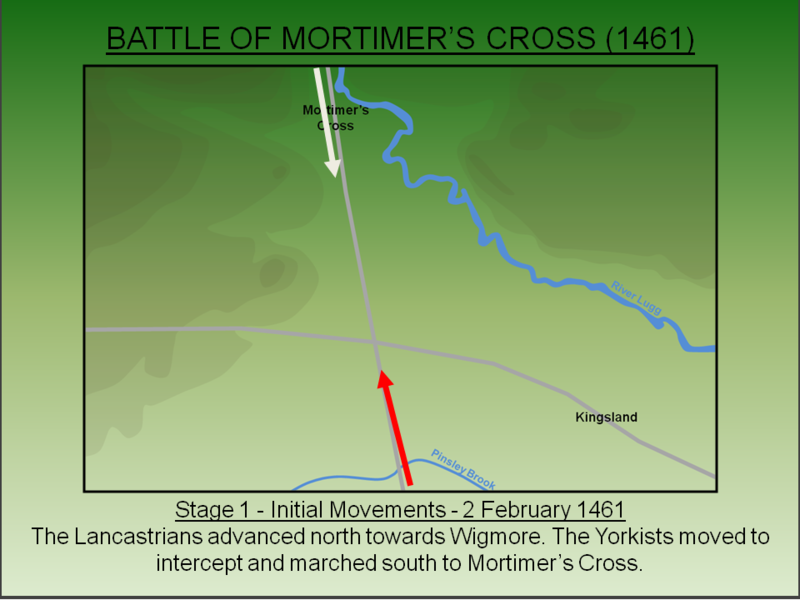 When Jasper turned left towards Kingsland and Wigmore, rather than continue on to Leominster, Edward moved his forces towards Mortimer's Cross. It was at this time that the Yorkist forces allegedly witnessed a ‘parhelion’, a rare meteorological event where the Sun reflects upon ice crystals in the cold morning air giving the impression of multiple suns. Edward spun this as a good omen and later adorned his own heraldry with the Sun. The Lancastrian force was commanded by Jasper Tudor, Earl of Pembroke. His army was comprised predominately of troops raised in South West Wales and led by local gentry who would have had minimal previous military experience. Tudor's deputy was James Butler, Earl of Wiltshire and Ormond and he had brought a sizeable Irish contingent with him who were deployed as part of the vanguard. 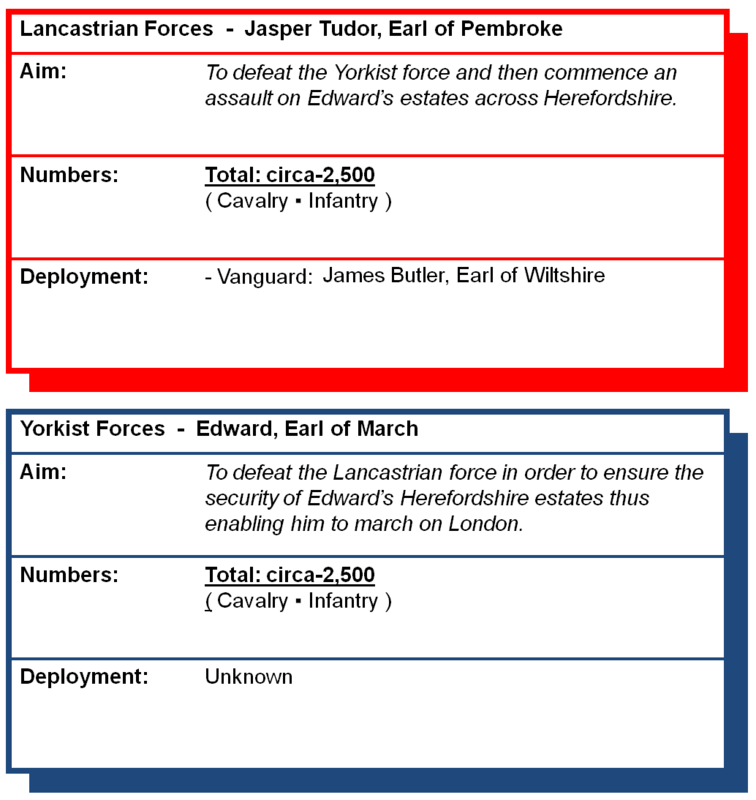 The Yorkist force was under the command of Edward, Earl of March. His army was recruited from Herefordshire, where the Earl owned extensive properties, and the vast majority of his troops depended upon Edward's success for their own prosperity. 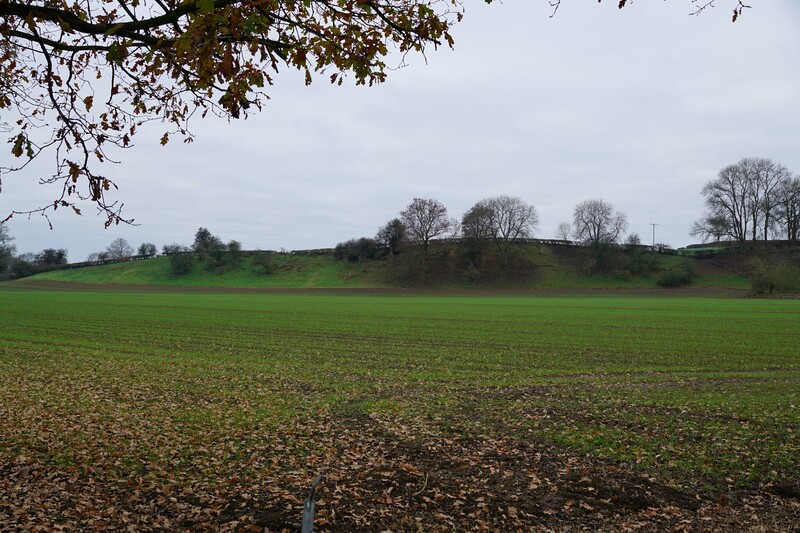 Whilst the battle was clearly fought in the Lugg valley, it has not been securely placed. 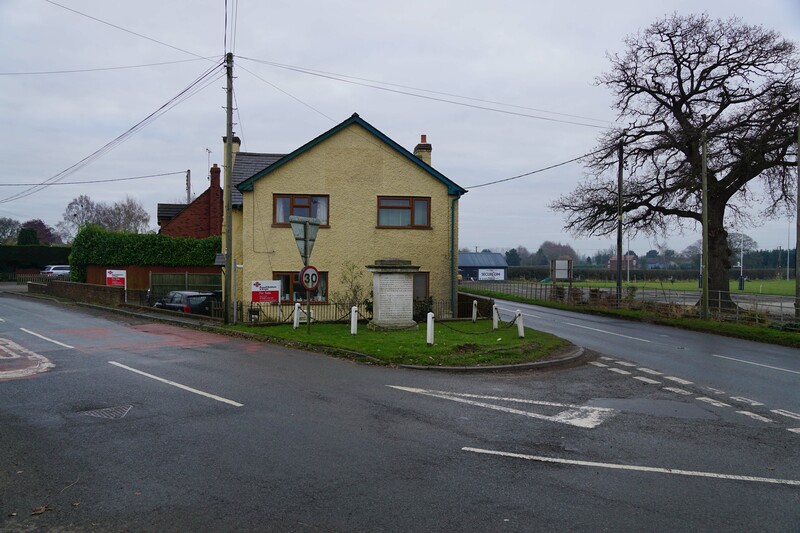 At the time of the battle Mortimer's Cross itself was a small hamlet located upon a north/south road running between Hereford and Shrewsbury. A short distance to the south was a crossroads with an east/west route that ran between London and Aberystwyth. Authors disagree whether the battle was fought to the north or south of the crossroads. There is also disagreement as to whether the Yorkists were to the north or south of the Lancastrians as some records place Edward in Gloucester in the run up to the battle. However, the suggestion that Edward was in Gloucester is almost certainly spurious. His supporters, who were largely from Herefordshire, were worried about a Lancastrian incursion into their home county which prevented him from deploying further afield. Therefore it is likely that Edward started the campaign at Wigmore. 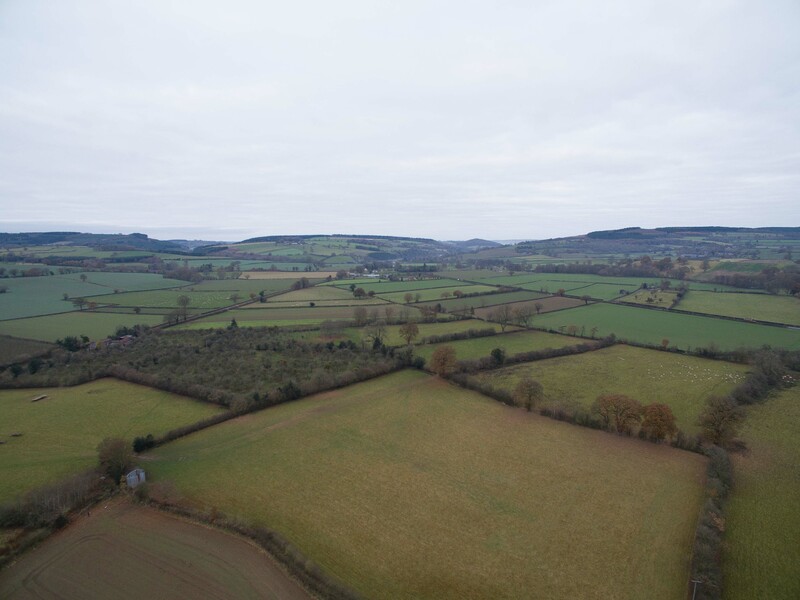 Furthermore the terrain to the north of the crossroads, which was flanked by high ground to the west and the River Lugg to the east, is the most credible location for the battle. Accordingly this narrative follows that scenario. The battle was fought on 3 February 1461 (some sources suggest 2 February 1461). Little is known about the sequence of events and, whilst various narratives add detail to the battle, none of these seem to be based on contemporary records. Edward was seemingly well informed about the Lancastrian movements. Probably using Croft Castle as his forward base, it became clear the Lancastrians were making for Wigmore and accordingly the Yorkists deployed near Mortimer's Cross on the old Roman Road running north from Hereford. Meanwhile Jasper Tudor advanced north along the same road also heading towards Wigmore. Edward mobilised his forces and moved south to intercept the Lancastrians. It is likely both forces bivouacked on the road overnight on the 2 February 1461. On the morning of 3 February 1461 Edward deployed his men on a flat plain flanked to the west by a ridge of high ground and to the east by the River Lugg. He configured his army in three battles - the vanguard, middle-guard and rearguard. Whether these formations drew in line abreast or stacked one behind the either is unknown although, in this context, the military utility of the latter must be doubted. It is possible that Edward placed archers on the high ground on the west although it should be noted that no primary sources support this suggestion. When the Lancastrians awoke to find the Yorkists blocking their path north, they too deployed in battle array. Who commenced the attack and how is not known. However records suggest that the Earl of Wiltshire, in charge of the Lancastrian vanguard, fled the battlefield early in the engagement presumably because his forces were beaten. It is likely his Irish contingent, which at best would only have been lightly armoured, suffered in the melee with the Yorkists. 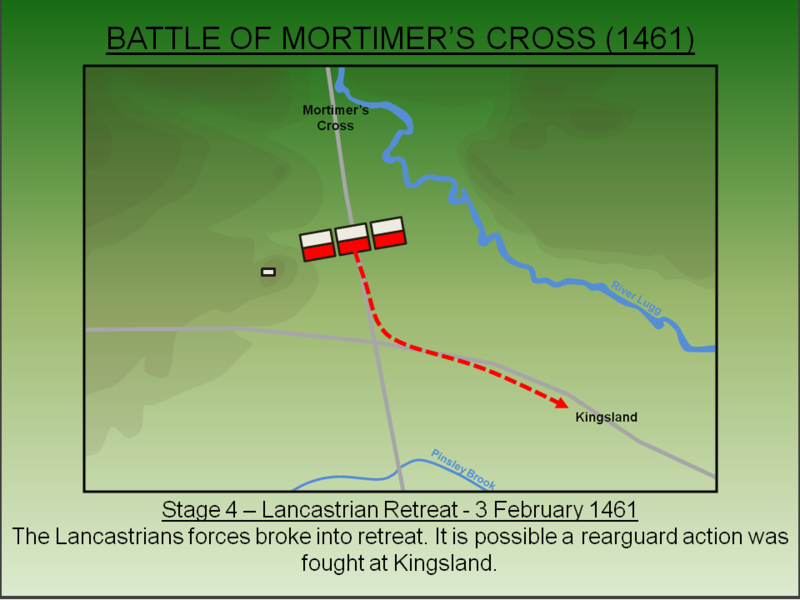 As the battle progressed the Lancastrians came off worse, broke into rout and were pursued south with some vigour by Yorkists. Whilst the contemporary claim of 4,000 slain is clearly a gross exaggeration, it is likely the Lancastrian casualties were heavy. Both Jasper Tudor, Earl of Pembroke and James Butler, Earl of Wiltshire escaped the battlefield but many other high status individuals did not. This included Owen Tudor, father of Jasper, who was captured and summarily executed in Hereford. 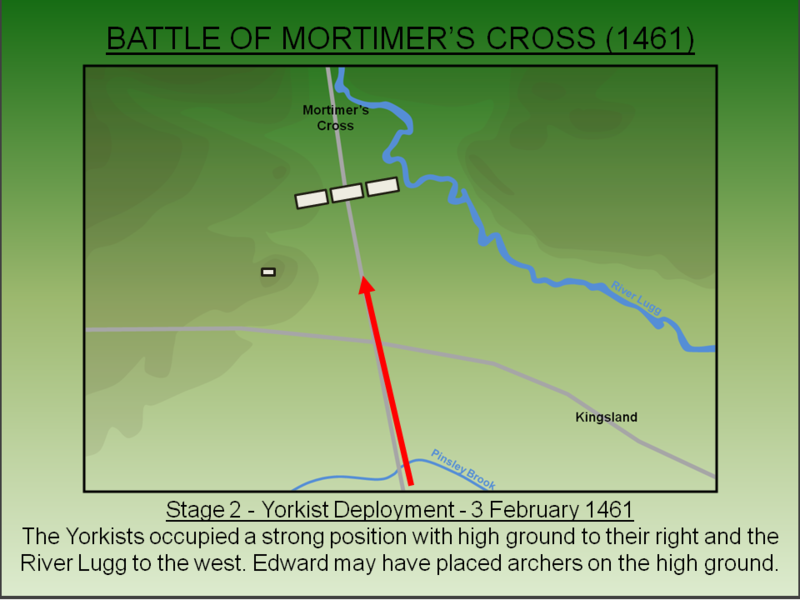 The battle was a victory for Edward and the Yorkists. With Lancastrian forces in the Welsh March defeated and the risk to his Herefordshire estates neutralised, Edward marched to London where he successfully wooed the city and was proclaimed King Edward IV. However, a subsequent Lancastrian victory at the second Battle of St Albans (1461) meant the captive Henry VI was now free. With England now having two Kings, both factions geared up for the decisive encounter. At the Battle of Towton (1461) Edward IV successfully defeated the Lancastrians and secured his throne. Whilst he would be briefly overthrown in 1469, he recovered his position and remained in power until his death in 1483. However, his dynasty was less successful with his young sons, Edward and Richard (the so-called 'Princes in the Tower'), deposed and probably murdered. Two years later the last Yorkist monarch, Richard III, was killed at the Battle of Bosworth Field (1485). Jasper Tudor, who was present at the battle, doubtless finally felt his father had been avenged. Dockray, K and Hammond, P.W (2013). Richard III: From Contemporary Chronicles, Letters and Records. Hodges, G (2001). Civil War of 1459 to 1461 in the Welsh Marches: Part 2. Lancaster, J.H.D (2017). 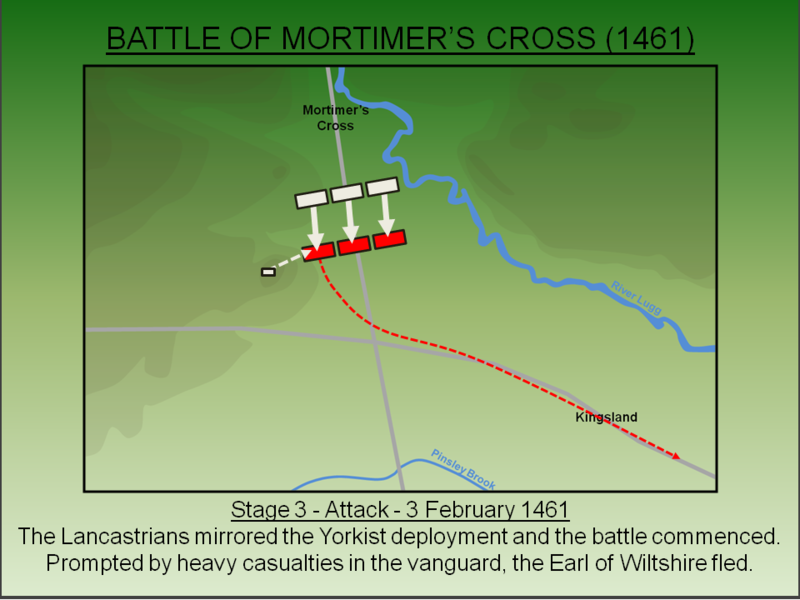 Mortimer's Cross: Battlefield visit notes and observations. CastlesFortsBattles.co.uk. Ordnance Survey (2015). Herefordshire. 1:1250. Southampton. The battlefield has changed beyond all recognition since the fifteenth century. Originally it was predominantly open fields but the area has now been enclosed with hedges. Furthermore the modern east/west road, which evolved from eighteenth century turnpikes, are in a different position to the London to Aberystwyth road that originally ran across the battlefield. Monument. The monument is found in Kingsland at the junction between the A4110 and the B4360, some distance south of the probable battlefield. Archaeological finds in the vicinity suggest a rearguard action was fought in the vicinity. Battlefield Landscape. The fifteenth century landscape would have been open, unenclosed fields. Hereford Lane. 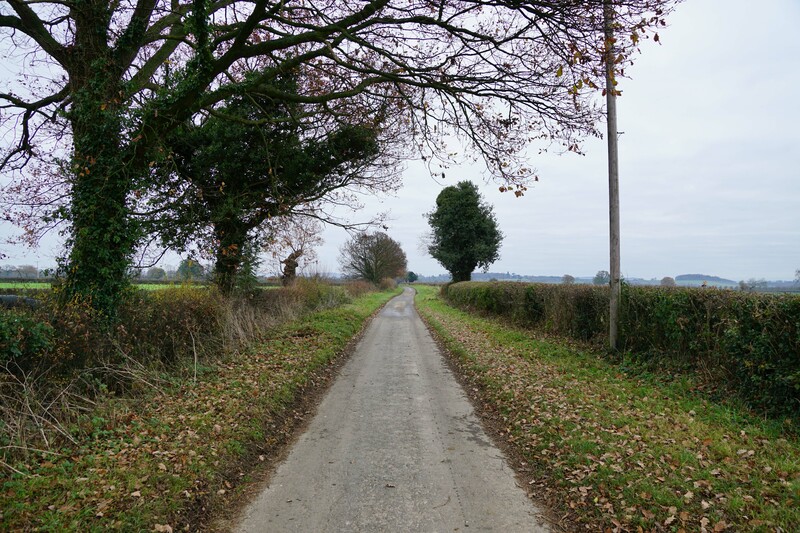 The lane follows the line of the Roman Road along which Jasper Tudor was advancing. Blue Mantle Cottage. The cottage is said to mark the location of the Lancastrian deployment. Originally an ancient tree, the Battle Oak, stood nearby. High Ground. Edward may have placed archers on the high ground overlooking the Lancastrian position. If so this explains why the Lancastrian vanguard broke so quickly. River Lugg. 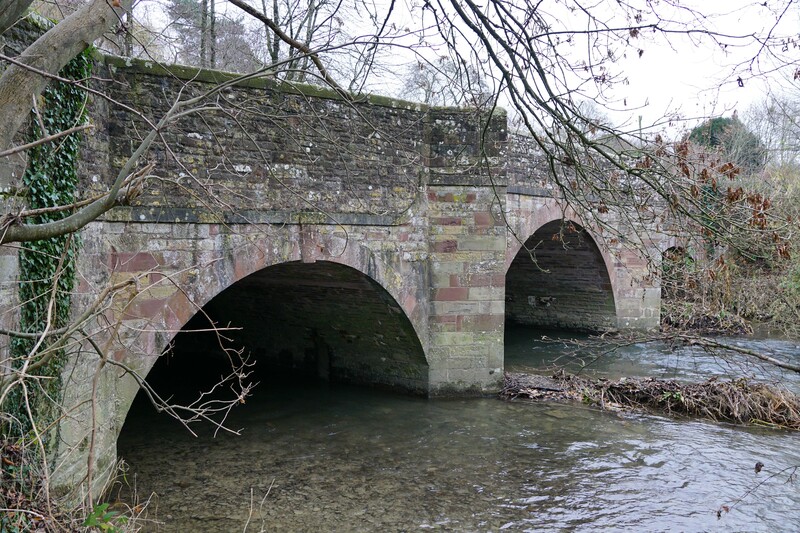 The Yorkists used the River Lugg to protect their left flank. 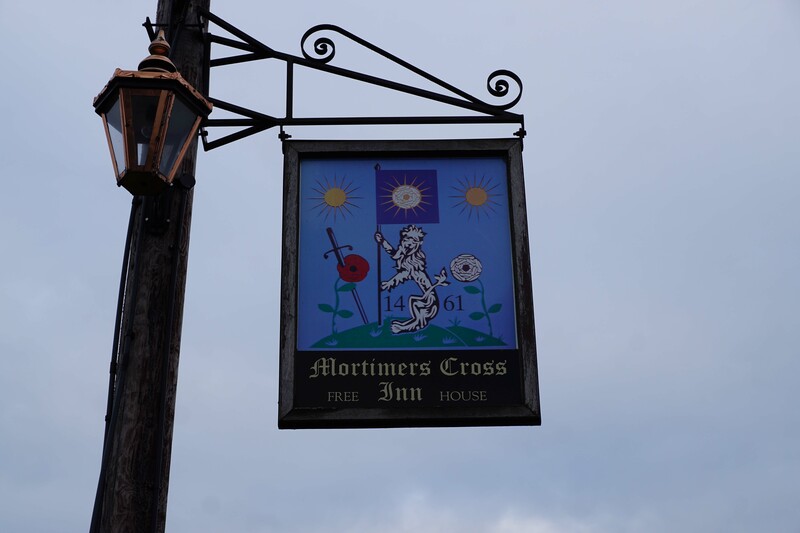 Mortimer's Cross. The local Inn commemorates the battle with Edward's parhelion reflected on its sign. Wigmore Castle. 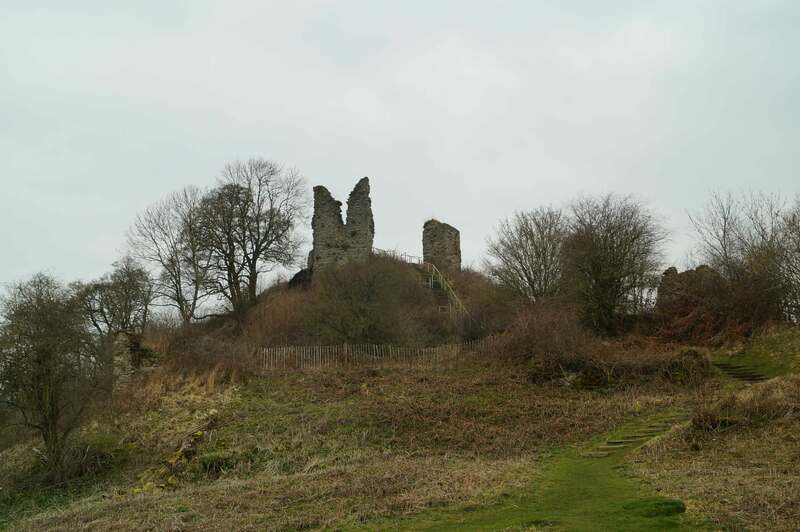 It is likely that Wigmore Castle, the seat of the Earl of March, was Jasper Tudor's target. Croft Castle. Now totally rebuilt into a stately home, Croft Castle probably served as the forward operating base as the Earl of March was deploying his forces. The Battlefield Monument in Kingsland offers a good starting point for exploring the battlefield. This can be found at the junction between the A4110 and North Road (B4360). On-road car parking is possible on the latter. 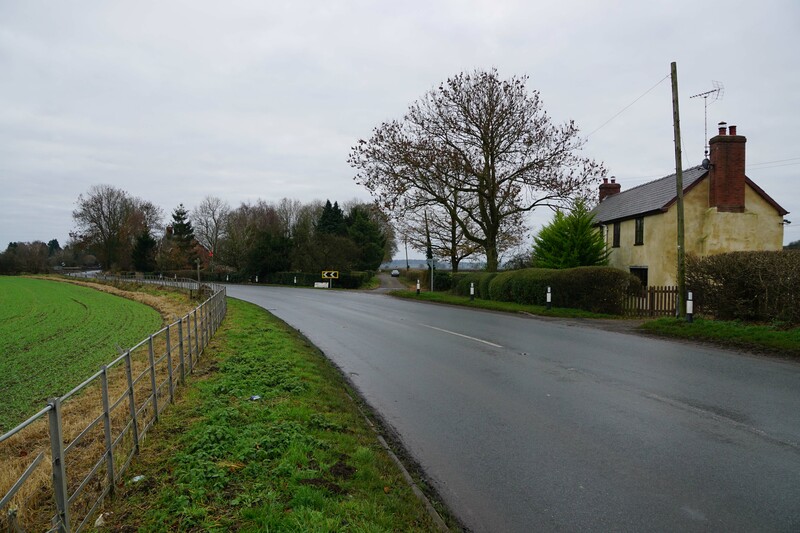 Visitors can then walk along North Road and Chapel Lane in order to access the public right of way on the other side of the A4110. This leads to Hereford Lane, the road along which Jasper Tudor advanced. 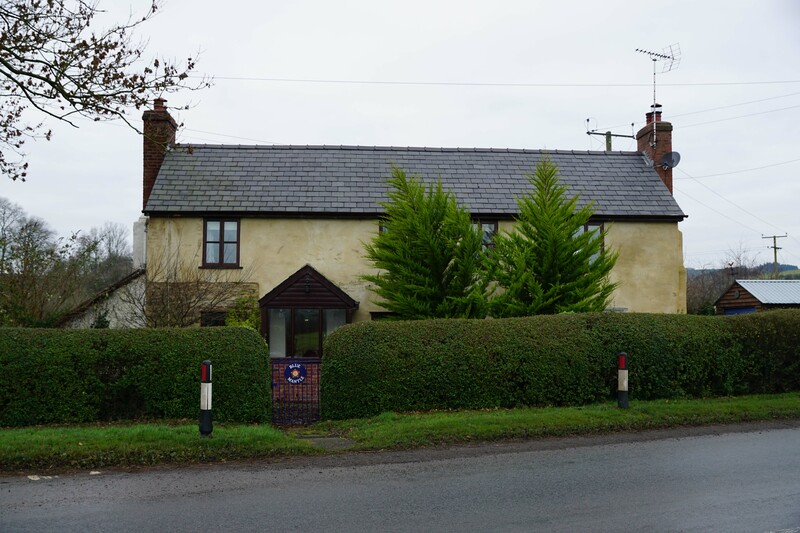 Follow the road to Blue Mantle Cottage and the Mortimer's Cross Inn - the location of which probably marks the scene of the main battle.